Here is your chance to get into compact and well-designed restaurant in Poway. Located in one of the busiest centers in the city. Super high turn shopping center brings heavy traffic to and past your door constantly. Restaurant is currently a Mediterranean restaurant but could easily be converted to Sushi, burger, chicken or Mexican food concepts. Seller is retired and does not want to (or need to) work the hours necessary to make this place into a money-making restaurant. This is a restaurant space that could really do well with the right ownership in place. Current concept is doing approximately 15k per month with no effort from ownership. Currently closed on Mondays and closes at 4:00 on Sundays, Tuesday thru Sat hours are 11-8pm. Lots of room to expand by simply opening regular restaurant hours. 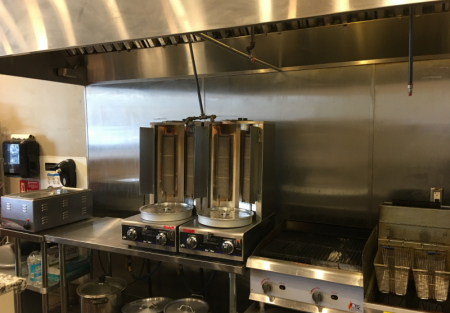 Well designed kitchen has 12 ft hood system, 24” x 36”char broiler, deep fryer, stove and oven, two cold prep sandwich tables, cold and freezer storage and much more. Sales tracked on a clover POS system. The restaurant has a small footprint with enormous potential, space is approximately 750 sq. feet, with all in rent of 3469/month. Current lease term expires Aug 31st 2019 with four (three years each) options. Poway as ideal demographics for restaurants with middle -upper middle income dominating the area. Provide tasty food and they don’t mind paying for it at all! If you have been looking for your place in Poway, you need to come look at this restaurant today.